Created in 1986, Test Valley Borough Council owns the Walworth Enterprise Centre and it is contract managed by Kier Property (Ventures Ltd) to enable small businesses to benefit from the favourable Licence Agreement 'Easy in Easy Out' terms that provide a business base with little long-term financial commitment. Good links to the A303 for transportation, local train and bus stations. The ready-made facilities consist of 38 different size units to enable businesses to set up quickly and take on extra or new space if they outgrow their original premises. Tenants also benefit from the supportive environment, professional Kier staff, advice and interaction with other small businesses. Units are let on a Licence basis by calendar monthly periods. The Licence fee is payable in advance together with estimated charges for the consumption of gas and electricity. A deposit equal to one month's rental is payable prior to occupation. Small office units starting at 194 sq ft are available from approximately £70.00 per week subject to availability. Licensees are accepted subject to the discretion of the Centre Manager and the supply of satisfactory financial details. 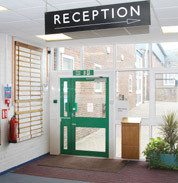 Reception, common meeting areas and toilets are provided for the use of Licensees. A private meeting room is available by prior arrangement free of charge to Licensees only. Out-of-Hours Emergencies & Security is managed "In-House"
There is a delightful and welcoming coffee house on site that provides delicious home baked cakes, celebration cakes, various snacks and hot and cold drinks. There is also some outside seating (weather and time of year permitting). If you are interested in finding out more about the Walworth Enterprise Centre, please contact us via our easy to use online enquiry form or call 01264 355841. The reception office is open Monday - Friday between 8.30am & 12.30pm. Management is normally on Site (which includes afternoons) apart from during holiday periods. New FRI lease available from 25th April at £25,000pax. PLUS a Unit to let on West Portway Business Park. Plot 50/Unit 3 Sopwith Park, West Portway, Andover. Excellent 201.1m /2165sqft semi-detached factory unit including pleasant offices. New FRI lease available now at £15,500pax plus service charge.